Our Inver Grove Heights kitchen remodeling project is one we are particularly proud of, and we wanted to share some information and photos with you. Time to celebrate the Inver Grove Heights golf condo remodel is now complete! And what a beautiful residential remodel this turned out to be. With the installation of new kitchen cabinets, Cambria stone countertops, new tile floor & fireplace & all new trim, doors & windows throughout, this condo remodel project is a true Team Titus showcase. Check the photos for some great kitchen finish work! 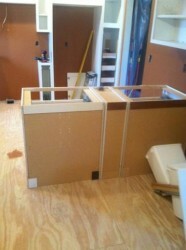 Thanks to our experienced and efficient team of sub-contractors, there is no job that is too big or too small for us. Customer service and quality craftsmanship are the name of our game, and these photos give you an inside look into our Inver Grove Heights kitchen remodeling abilities. You can see that white cabinetry was chosen, which gives the room a nice, clean and fresh look. One of our home remodeling workers is taking careful measurements to ensure the new cabinetry is level and looks its best. 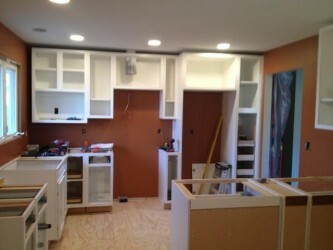 And here is a good look at the kitchen as a whole and the kitchen remodeling work that has been completed so far. 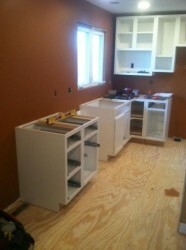 The Inver Grove Heights kitchen remodeling project is nearly complete! Titus Contracting is an award-winning home remodeling company that serves Inver Grove Heights and the surrounding areas. Do you have a summer kitchen remodeling project? As you can see in the photos above, we are perfectionists when it comes to remodeling – kitchen remodeling projects, bathrooms, basements, additions, theater rooms – you name it! You can even check out our testimonials page to see what your Inver Grove Heights friends and neighbors have to say about our services and the quality of work we do. Or you can check out our kitchen remodeling gallery for ideas and inspiration for your kitchen remodeling project. When you look around your Inver Grove Heights kitchen, are you happy with what you see? Or is it time to remodel? Inver Grove Heights kitchen remodeling company Titus Contracting is here to help! Our team of expert contractors can help you come up with the perfect design for your new Inver Grove Heights kitchen remodeling project. We have helped plenty of your Inver Grove Heights friends and neighbors with their kitchen remodeling projects. Just check out our gallery for plenty of ideas and inspiration for your project. There are so many things to think about when you’re starting a kitchen remodeling project, but our team of experts can walk you through the process step-by-step. What kind of budget will you be working with? 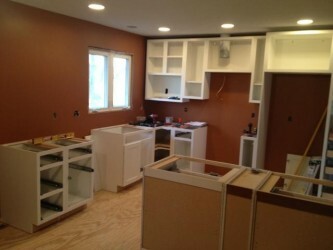 What is your ideal time frame for this kitchen remodeling project? What kind of floor plan do you want? Will you keep your old one or come up with a new one? What kind of new appliances do you want, if any? What kind of cabinetry and countertops do you like the best? What other accessories do you want, like soap and hot water dispensers? But don’t worry if you don’t have the answer to these questions yet. That’s what Titus Contracting is here for! 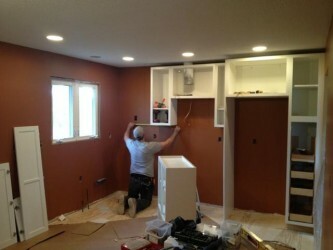 When you call us to start discussing your Inver Grove Heights kitchen remodeling project, we can help you figure out what you want, the price range, the time frame and all of the other details that go into a project like this. As soon as you’re ready, give Scott rajavuori, president of Titus Contracting, a call at (952) 444-2301 or contact us online. One of our experienced team members will get in touch with you shortly to start designing the Inver Grove Heights kitchen of your dreams!